Looking to squeeze your own juice at home? Want to make your own fruit wines? We are excited to share that we now have Equipment for Rent! All equipment is easy to use and is commercial grade! 20 and 40 Litre Bladder Presses and our Apple Crusher! The bladder press was designed to improve the traditional wooden-basket ratchet-style press. A rubber bladder expands from the stem outward using water pressure- pressing the fruit against the sides of the cage. This style of pressing is much more subtle and softer on the fruit, not allowing bitter tannins to be extracted from cracked seeds. This is also a more efficient method of pressing- cutting the cycle down to less than half the time a ratchet-style press would take. Water is used to inflate the press. Comes with a stainless cage, painted lid and basin, along with mesh liner and plastic splash guard. Drain pipe, pressure release valve and pressure gauge all included. 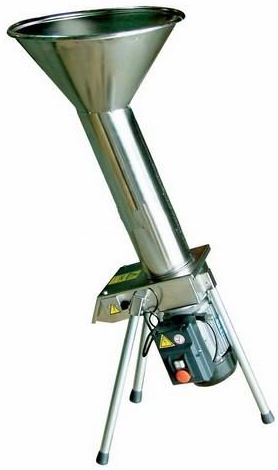 Mill, entirely made of stainless steel, to crush apples and pears ONLY. Easy working and highly productive. This machine makes crushing apples and pears a breeze. It takes whole apples and pears and turns them into a sauce consistency. The opper has a large capacity. Simply drop your fruit into the top and catch it in a bucket at the bottom. 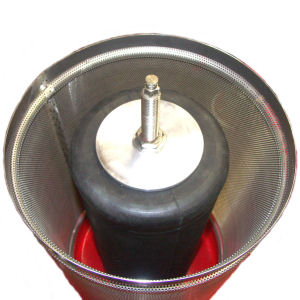 Don’t forget, the crushed fruit can be pressed using our bladder press. You will have pear and apple juice in no time!